Place the diced tomatoes, tomato sauce, pork and beans, and taco seasoning into a large pot. Stir together. Heat pot just until boiling. Serve topped with avocado, cheese, and sour cream. Enjoy! Wing-It Wednesday is a brand-spankin' new Quick Dish series featuring super simp suggestions for weeknight, work-night eats. No take out. No delivery. No drive-thru. Quick yums right at home between your day job and evening fun. It happens more often than I dare admit. Five o' clock and I haven't even thought about what's for dinner tonight. Nor do I have time to think about it. There are dance lessons to carpool to, after-school club meetings, a whole batch of laundry waiting to be folded. There are just some nights (okay, LOTS of nights) when making dinner is an inconvenient time-sucker. 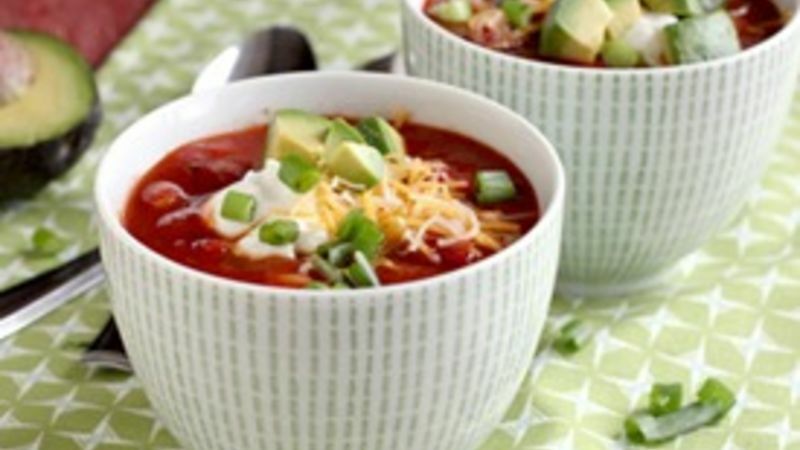 This recipe for 2-Minute Taco Chili is my go-to meal for crazay nights. Just 1 can of beans, two cans of organic tomatoes (Glen Muir tomatoes lend exceptional flavor and texture) and one pack of taco seasoning are all you need to make an amazing tasting dinner. We love topping ours with shredded cheese, diced avocado, sour cream and sliced green onions. Of course, you can top it with whatever you please -- a bit of spicy salsa, a smidgen of cilantro, or jalapenos would also make a great combo with this snappy, fantastic chili! And for the easiest ever dessert, try this Slow Cooker Chocolate Cake Recipe. Throw it in the slow cooker and turn it on -- it'll be ready when you are! What's your secret weapon dinner for weeknights on the go?